Smart Voice is the next generation of automation control, providing the simplest of user experiences. Until recently, smart home control required contact with a physical device, be it a switch, an app or a remote. Smart Voice finally removes need, providing control in the most natural, intuitive and convenient way possible. Smart Voice changes any smart home into the home of the future, providing voice control over a range of automation systems. Smart Voice makes use of the latest in voice assistants, allowing customers to interact with their home via a smart speaker. Smart Voice uses simple and adaptable voice commands to operate virtually any device, system or appliance. Users issue a command to their voice speaker of choice (example below is Amazon Voice Speaker). Speaker sends voice command to Alexa Cloud Service which processes the command and sends it to the Smart Voice cloud platform. 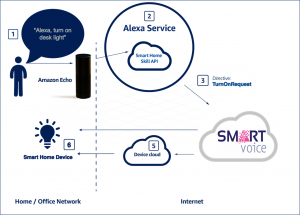 The Smart Voice cloud platform translates the command into the appropriate Smart Home device command, connects to the Smart Home network and relays this command to the local Smart Home Controller. The Smart Home Controller responds, and the Smart Voice cloud platforms relays the answer back, via the Amazon Service to the local Smart Speaker, informing the user that the command has been processed. With all major companies releasing Smart Speakers, the market for voice control is tipped to reach $5.5bn over the next 5 years. 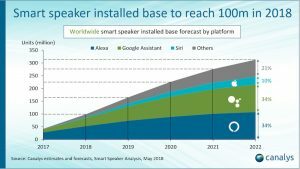 Smart Speakers are predicted to reach an install base of 100 million worldwide by the end of 2018. That is a serious incentive to get on board with voice control!